Though the Jamboree originally departed from Wentworth Springs, today's participants stage and collect their lunches at Loon Lake, on the edge of the Granite Bowl. Lunches, provided by the VFW (Veterans of Foreign Wars), are still a bag of fried chicken and fixings. 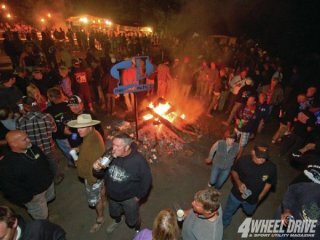 The community tradition of the Jamboree is still strong, as this is the VFW's largest fundraiser of the year. The same applies to the Placerville American Legion, which manages the Jamboree kitchen and saloon in Rubicon Springs. The view from Loon Lake is a spectacular example of Mother Nature at her finest. Ancient pine and fir trees rise from small fissures in solid granite, lining the approach to the fist obstacle. The Gatekeeper, appropriately named due to its difficulty and location at the beginning of the trail, filters out all but the most capable vehicles. The Granite Bowl dipped to the north, hosting a parade of Jeeps, Toyotas, Land Rovers, and vintage Broncos (the Jamboree allows all makes of 4WDs). Each section of the trail seems to have been labeled: the Big Sluice, the Little Sluice, and the Soup Can. Then there are those tough spots named after Jamboree pioneers, such as Walker Hill and Arnold's Rock. Though only 16 miles in length, it would take the entire day to reach the cool waters of Rubicon Springs. By late afternoon, we arrived at Buck Island Lake, where the mechanic crew was busy fixing broken vehicles. The Jamboree helicopter swept overhead on a low pass and landed on a granite helipad. One of the mechanics ran off to collect parts for one of the damaged Jeeps. 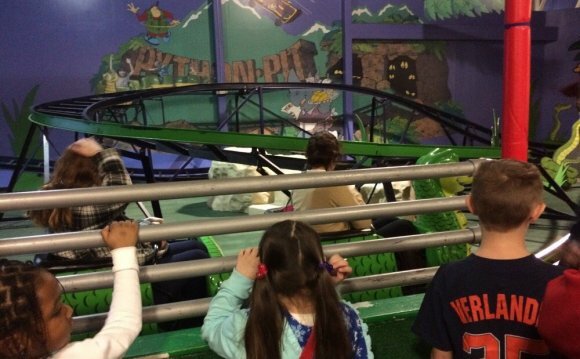 "Jeepers Jamboree has a motto, " said Jamboree President Dan DeWolf. "We'll get you in, and we'll get you out." If your vehicle needs repair, there is no charge for the labor or helicopter, just the replacement parts. Beyond Buck Island lies Rockbound Lake and the Desolation Wilderness area. The last section before arriving in Jamboree main camp in Rubicon Springs is a boulder strewn descent known as Big Sluice. Crossing an Erector Set–type bridge over the Rubicon River places you firmly in Rubicon Valley. Evenings are spent around the campfire and bellying up to the bar at Amos’ Place for a cold libation. The Jamboree offers three-, four-, and five-day trips. The first day is spent on the trail, with the following days relaxing by the river, enjoying main camp, and being pampered with home-cooked meals from the Jamboree kitchen. Evenings are usually around the campfire, bellying up to the bar at Amos' Place for a cold libation, and enjoying the live band. 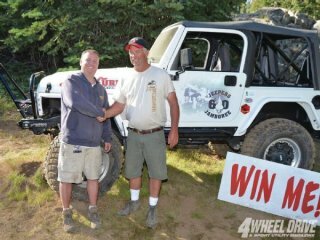 This year, they gave away a fully equipped Jeep Wrangler to one lucky participant to celebrate the 60th Jamboree. For many, the Jamboree has become a generational family tradition. I talked to folks who experienced the Jamboree as teenagers, bouncing around in the back of their fathers' CJ5s and whose grandfathers attended Jamboree back in the '50s in an old Willys flatfender. Saturday afternoon, while 57-year Jamboree veteran Steve Morris gave a historical talk on the area, I sat with Mark Smith at the Rubicon Springs Ice Cream Parlor and listened to his recollections of the event. Mark, now 85, is a legend in the four-wheel-drive world. As one of the founding fathers of the Jeepers Jamboree and Jeep Jamboree USA, he has led Jeep trips around the world. He, along with hundreds of other Jamboree staff, has been instrumental in the development and success of the event. Smith said, "It is hard to realize that 60 years ago we started something like this. I had no idea that I would even be here for a 60th Jeepers Jamboree. It is a great pleasure to be here today, to meet old friends, see faces again." While Mark stopped to sign an autograph and take a photo with a fan, I asked Dan DeWolf about the next 60 years. He smiled and said, "Now that the Rubicon is an official county road, we have a very good chance to keep the trail open for future generations of 4WD enthusiasts. As for a 120th or 100th Jamboree, I probably won't be here, but I sure hope the Jeepers Jamboree is, and I hope people are still enjoying this amazing place."